This topic is so important, regardless of if you live with mental health challenges or not. We live a society that honors and promotes self-exhaustion. Jobs and corporations expect burnout and sleepless nights. If you’re not working as hard as the senior vice president who’s on the brink of a full-on nervous breakdown, then you’re not working hard enough. We age ourselves, we deplete our energy, and we are creating turmoil within our bodies when we live like this! I think that’s why so many more people are jumping from the corporate landscape into the entrepreneurial world. Why should we destroy our mental health, our physical health, and basically our entire lives for a paycheck at the end of the week that barely pays the bills? Especially if there’s another option out there. An option where you can choose when you work, how hard you work, and what you work on. When the end goal of your time and effort goes to something more than a paycheck, it’s much easier to get the motivation to keep going. When you run your own business, you’re working for a cause that matters to you. You’re working for something that resonates with you on a soul level. You’re working to leave your mark on the world. It’s a wonderful change of pace from working in the corporate world, but entrepreneurship comes with a whole slew of other obstacles that we need to learn how to face. I’ll start with the big dog on the list… Don’t compare your business success or your business failures to your own self-worth. You are so much more than your business! Seriously, yo! Don’t equate your business wins or losses to your personal worth. The two are totally unrelated, even when you’re the one making the decisions. Got it? Good. Start to celebrate small successes and make it a point to reward yourself for any form of growth. We look past these moments way too often and just focus on the next big thing we have to do or what we didn’t accomplish to our liking. Find a business bestie or a coach who you can bounce ideas off of when you are going through a rough patch. It's not fun to do this journey alone and it’s much easier to stay accountable for your goals when someone is working alongside you (even if they’re not necessarily working for your business). Stay off of social media. It's much easier to not compare yourself to others when you're not constantly submerging yourself in other people's wins and highlighted moments. Social media feeds are curated to make people look like they’re living their best life. No one is going to show that they are making 0 dollars and about to lose their house! No, they are going to post about how grateful they are for their family, friends, and followers. They will post testimonials from clients past hoping to inspire new clients and they will start offering discounts or new dreamy products! Remember to not let the small setbacks push you down. If something doesn’t go exactly the way you planned for it to happen, remind yourself that tomorrow is a new day with 24 bright shiny new hours to get back on track. Nothing is ever a lost opportunity. Please ONLY focus only on what you can control. You can’t predict the reaction of other people but you can make sure you’re putting in your best effort accompanied by enormous amounts of heart and soul into everything you create. If you’re passionate about what you’re creating and your work exudes that passion, the world will love it too. I promise! And for the love of all things holy, don’t take on too much at one time. It will cause you to burn out and stop working altogether as opposed to your initial idea of working overtime. (Remember that corporate world, baby!) Pace yourself and remember that you have all the time in the world to bring these ideas to life. When you take on too much at one time, there’s no way to fully develop your best ideas and give them the love they need to bloom. A Life Filled with Self-Love & Self-Care? Be sure to print it out, take a pic, and tag @SPIESFitToFight on Instagram! If you have any other tips, please comment below and let me know! I’d love to feature your ideas on the blog or on my social media. And if you're an entrepreneurial women who struggles with anxiety, I recommend you check out my new course, The Decaf Doers Playbook. My new online course is the ultimate resource for running a successful business while maintaining your mental health! If you loved this blog post I know you're ready to work smarter, not harder. Which means you're also ready to have an action plan for your business, time saving systems, and automatic workflows that create BIG results using LESS of your time. 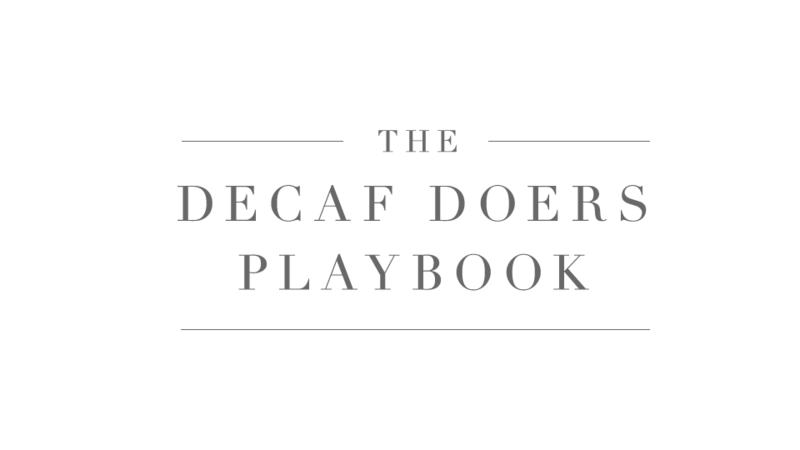 You'll find all that and more inside The Decaf Doers Playbook, so what are you waiting for?!? Click here to learn more about this new course!